In November 2016, our article entitled ‘Female Genital Mutilation/Cutting as a Ground for Asylum in Europe’ was published in in Volume 28, No. 3 of the International Journal of Refugee Law (IJRL). Although I am currently working as an individual consultant, I still find it important to publish in academic journals. 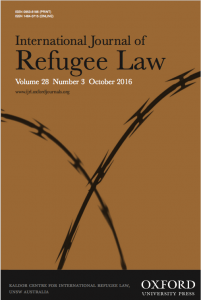 The International Journal of Refugee Law is the leading peer-reviewed journal on all aspects of international law relating to forced migration. It has become a key source for those working in the field of refugee protection. Therefore, we feel very honored that our article has been accepted by this prestigious journal. 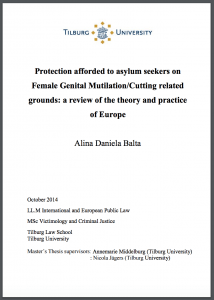 I wrote this article about FGM/C and asylum in Europe together with Alina Balta. She has been one of the students I supervised during the writing of her Master Thesis at Tilburg University. She defended her Master Thesis entitled ‘Protection afforded to asylum seekers on Female Genital Mutilation/Cutting related grounds: a review of the theory and practice of Europe’ in October 2014. With this thesis, she completed the LL.M International and European Public Law MSc Victimology and Criminal Justice at Tilburg Law School. She wrote in her acknowledgments the following words that touched my heart: “I would like to express my deep gratitude to my MSc Victimology and Criminal Justice supervisor, Annemarie Middelburg, who has guided me through this challenging process of writing a combined Master’s Thesis. She has inspired me with her passion and love for her work and provided me with guidance and encouraging support throughout this research.” Alina was also one of my interns who helped me considerably with transcribing interviews and other related research tasks for my PhD research in Senegal. 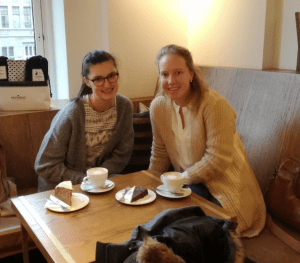 We decided – after she finished her Master Thesis – that we should rewrite her thesis and transform it into an article that we could submit to a journal. It took us a couple of months to write the article, but we both really enjoyed working on it. We decided to aim high, and we submitted our article to the International Journal of Refugee Law. We realized that our article needed to be really good, especially since so much is going on in the field of migration law at this very moment, which results in a lot of competition. However, a couple of weeks after we submitted our article (in September 2015), we received a very nice e-mail of the Editor-in-Chief of the IJRL saying that our article would be publishable if some revisions were made. We were invited to revise and resubmit our manuscript for further evaluation! The useful and instructive comments of the reviewers helped us to further improve the article and to reduce the amount of words. This process took a couple of months (well, almost a year…), but we are so proud and happy to announce that our article has recently been accepted and published in the latest issue of the IJRL! You can download the article by clicking on the page below.